Torticollis treatment goals include ruling out an underlying disorder, increasing range of motion of the neck, and correcting the cosmetic deformity. Some infants with muscular torticollis may respond to nonoperative measures, which include range of motion exercises of the head and neck and stretching of the restrictive muscles several times daily. General indications for nonoperative management include age younger than 1 year, positive response to stretching exercise over several weeks, and no underlying cervical spine abnormalities or CNS findings. Principles of surgical management of patients with muscular torticollis include identifying and releasing all restricting bands involving the sternocleidomastoid muscle and other neck structures, moving the head through a full range of motion before completion of the surgery, and resuming physical therapy within 2 weeks of operation to prevent recurrent contracture. 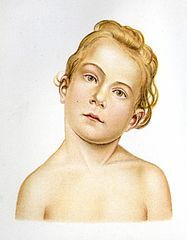 The literal definition of torticollis, also known as wry neck or loxia, is twisted neck, but the traditional definition is shortening of one sternocleidomastoid muscle. Shortening and secondary contractures can be a primary abnormality of the sternocleidomastoid muscle (muscular torticollis) or secondary to CNS or upper cervical spine abnormalities. Infants and young children with muscular torticollis have the ear pulled down toward the clavicle on the ipsilateral side. The face looks upward toward the contralateral side. 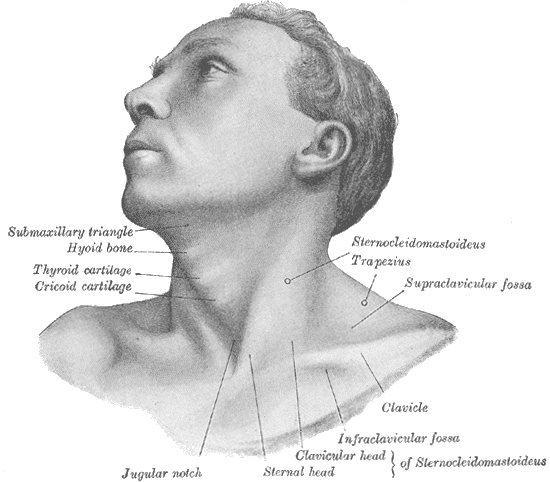 Early in infancy, a "tumor" or thickening is palpated in the lower to mid portion of the sternocleidomastoid muscle. This thickening represents swelling or fibrosis of the central portion of the muscle and often is a precursor of the subsequent contracture. Skull and facial asymmetry or plagiocephaly may be present in congenital cases. In infants, in utero malposition, birth trauma, sternocleidomastoid muscle compartment syndrome, and heredity have been implicated as etiologic factors. In acquired torticollis in children, CNS mass lesions, abnormalities of the cervical spine, and local head and neck infections are more likely. Psychiatric causes may occur during adolescence. A thorough neurologic examination should be performed, and anteroposterior and lateral radiographs of the cervical spine should be obtained. A CT scan or MRI of the head and neck is necessary for any patient with persistent neck pain or with neurologic signs and symptoms. When putting your baby down to sleep, position him or her to face the wall. Since babies prefer to look out onto the room, your baby will actively turn away from the wall and this will stretch the tightened muscles of the neck. During play, draw your baby's attention with toys and sounds to make him or her turn in both directions. Torticollis treatment include medication, physical devices, botulinum toxin, physical therapy, stretching exercises, and surgery. In most people, torticollis resolves in several days to a few weeks. A few people will develop continuing neck problems for months to years. Persistent neck muscle spasms may require referral to a neurologist or surgeon. It is important that parents get their child into physiotherapy as soon as possible. The older the child is, the tighter the SCM becomes and the harder it becomes to stretch the child due to their increased activity level. At the physiotherapy initial evaluation the parents will be given a home exercise program including range of motion exercises, massage instructions, positioning ideas to discourage the child’s favored position, and strengthening exercises to help decrease any asymmetry that may be occurring.